Vita 57 provides a mechanical standard for I/O mezzanine modules. This standard introduces a methodology that shall allow the front panel IO of IEEE 1101 form factor cards to be configured via mezzanine boards. Vita 57 modules have fixed locations for serial/parallel IOs, clocks, Jtag signals, VCC, and GND. HiTech Global's Vita 57 modules can be plugged into any Vita 57 compliant carrier boards. 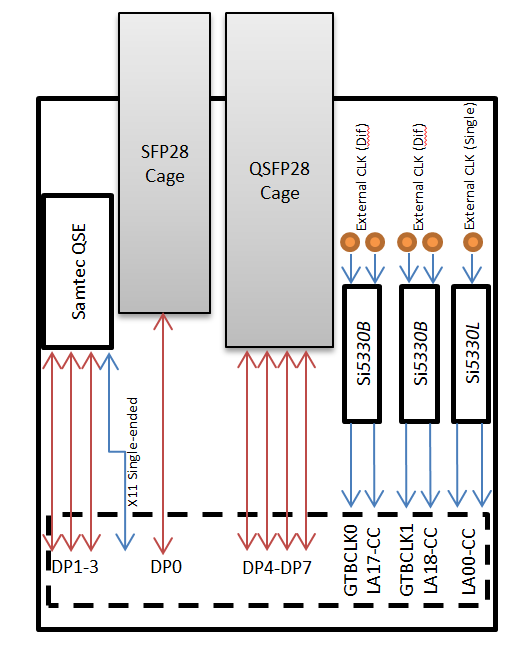 This Vita57.1 compliant FMC module is supported by one QSFP28 (100G/40G) , one SFP28 (25G/10G) and one Samtec QSE connector. Reference Clocks for the serial transceivers and FPGA are provided externally through SMA connectors and distributed by Silicon Labs Si5330L and Si5330B buffers.